I wanted to let everyone know that Amazon is having a sale on Tinkyada Gluten Free Pasta. 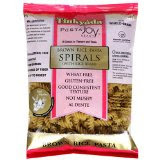 This is one of the best brands of gluten free pasta and would be great used in combination with the Rao's Pasta Sauces. Available at Ms. Celiac's Market! Buy at SALE PRICE for a limited time!